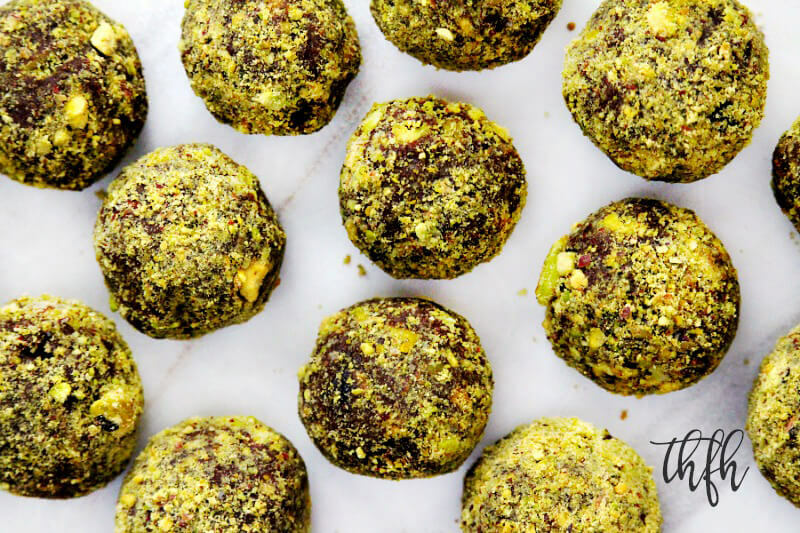 These bite-size Lectin-Free Vegan Chocolate Avocado Pistachio Truffles are made with only a few clean ingredients and are ready in about 5 minutes! I’m so happy to share an indulgent lectin-free treat with you to have on hand when you need a little something sweet. Even though these are naturally sweetened with organic medjool dates, each piece has approximately less than 10 grams of sweetener, so you wouldn’t want to eat more than one at a time. These are meant to have as a stand-by for a quick treat with a cup of herbal tea or as small after dinner dessert. I keep mine in the refrigerator and take one out each day for an afternoon snack. They’re full of healthy fat from the avocado, coconut oil and almond butter and they don’t have an overly sweet taste to them, which I love. My healthier version is organic, raw, vegan, gluten-free, dairy-free, lectin-free, soy-free, no-cook, paleo-friendly and contains no refined sugar. Want more healthy truffle recipes? 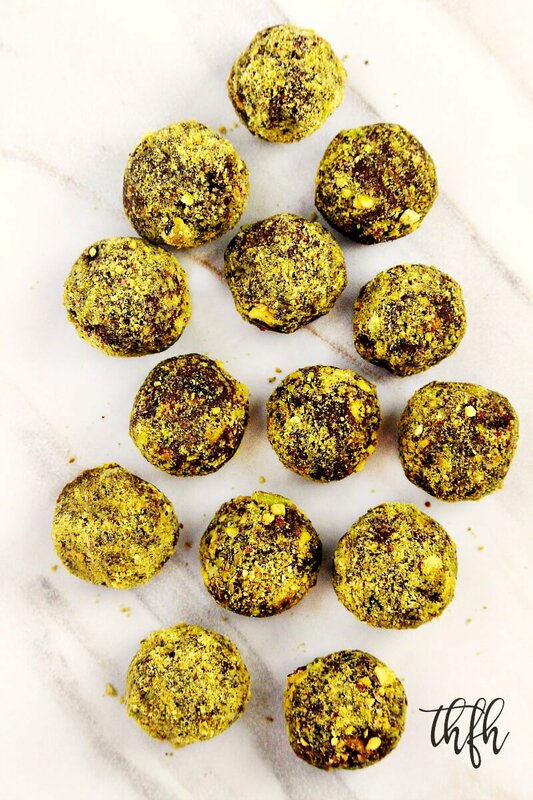 Check out Vegan Chocolate Fudge Truffles, Clean Eating Vegan Raspberry Truffles, Raw Vegan Apricot and Date Protein Truffles or my Clean Eating Cookbook with an entire chapter of 20 healthy, clean eating ball and truffle recipes just like this one that you will love! For the add-ins: Chop the pistachios into small pieces using the flat side of a butter knife. Set aside. For the coating: Add the pistachios to a coffee grinder and grind them into a powder. Transfer to a small bowl. Set aside. Add all ingredients for the truffles to a food processor and process until it forms a thick ball. It should be moist and wet. Add the chopped pistachios and stir in by hand until they are evenly distributed. Take out a spoonful at a time and roll into a ball shape between the palms of your hands. Add each truffle to the bowl of ground pistachios and gently toss until the entire truffle is covered. Place the coated truffles on a plate lined with parchment paper. Enjoy immediately or place in the refrigerator for 10-15 minutes to firm. Store in a BPA-free air-tight container. The recipe and photographs for "Lectin-Free Vegan Chocolate Avocado Pistachio Truffles" by Karielyn Tillman of The Healthy Family and Home website are licensed under a Creative Commons Attribution Non-Commercial No Derivatives 4.0 International License and cannot be used without my written permission. Recipe Roundups: Food Bloggers are always welcome to use a photo and a link back to my post for recipe roundups without permission.